Congrats to Cathy ( from the Fran and Cathy duo! ) ... she has won our Moda Bag! I am sure she will fill it with yummy goodies. 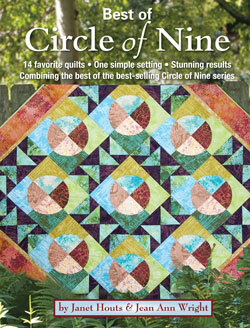 Our next draw will be for an autographed copy of the book "Circle of Nine". I met one of these sweet gals at Quilt Market and I just love their new book. The draw will be held June 13th... like this post on our Facebook page or stop by to have your name entered into our draw!